Markets will be nervously eying events in China this week with particular emphasis on the Chinese authorities and any possible intervention. An important batch of trade data is also due overnight. The Chinese trade balance is expected to fall to 55.7B dollars in June. Turmoil in Chinese financial markets has had the usual knock on effect on metals and the energy sector. Industrial metals made a small recovery on Friday after steep losses throughout the month. Prices for copper, palladium and platinum lifted on improved sentiment. Brent crude also ended the week 2 USD higher. The Australian dollar has been pummeled by events in China, but has seen some stabilization recently. AUD/USD remains at a six year low of 0.7442 but managed to hold off on further falls. 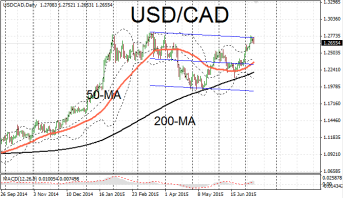 The Canadian has also suffered, despite some optimistic signs on the economy and employment market. Canadian unemployment fell unexpectedly to 6.8% in June. The net change in employment was higher than expected. Nevertheless, uncertainty around china and depressed commodities prices continue to take their toll. 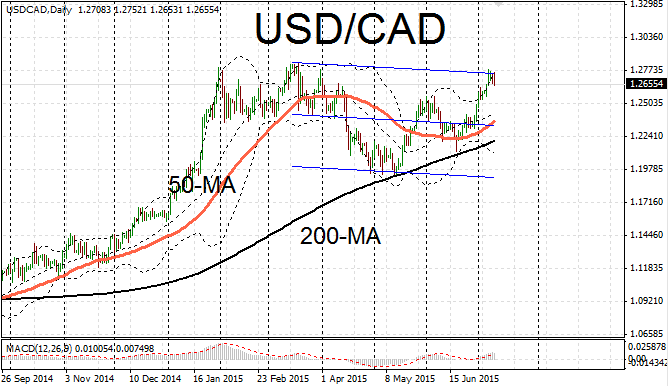 USD/CAD eased back from highs to 1.2655. The pair lies at the top of the horizontal range entrenched since mid-February. Crucially markets are waiting to see if authorities will bring in further measures to try to calm the rout in the country’s stock markets. Authorities have already signaled that they will do “whatever it takes” to bring order to financial markets. However some have pointed out that this degree of intervention could undermine the essence of the free market. Chinese stock markets have shed some thirty percent of their value in the past month. The main losers are the many millions of middle class private investors. This segment is the main driver behind the massive consumer boom in China and therefore the crash could have a major slowing effect on the Chinese economy. Retailers are already reporting a drop in orders of luxury items as burnt investors hunker down and nurse their losses.